This conservation resource was created by Marissa Glavas; Cliodhna Reidy; Erica Dos Santos; Dionne Wong. It is shared under a CC-BY 4.0 International License. Following decades of the disappearance of grey wolves in Yellowstone National Park, in 1995 a reintroduction of this species caused significant alterations both in the present inhabitants, as well as the park’s landscape characteristics. Understanding the history of Yellowstone’s ecosystem prior to the reintroduction is vital in analyzing the influence of grey wolves on other species both directly and indirectly within this ecosystem following their re-establishment. Through direct effects, such as predation, wolves greatly changed wildlife populations and in turn, the abundance of plant communities, as well as affecting the landscape indirectly through changing river patterns and increased soil production. Aside from environmental factors, the decision to reintroduce grey wolves back into this ecosystem sparked social and political debate over whether this decision would be beneficial to Yellowstone National Park. In this wiki page, we delve into key concepts on the effects of wolves on various wildlife, plant species, and characteristics of the natural landscape, political and social implications, and ultimately, we explore how the reintroduction of grey wolves restored the ecosystem within Yellowstone National Park. A Yellowstone wolf having recently hunted an elk, has attracted various scavenger bird species.By Jim Peaco of US National Park Service. Public Domain. Prior to European colonization, there was harmony between local Indigenous communities and wolves. The Indigenous peoples of the area viewed wolves as part of nature, thus being joined with humans in one common environment . Indigenous communities shared their living space with the wolves and other species, and respected wolf presence as many aspects of nature were cherished in the Indigenous peoples culture . However, this view on wolves changed as settlers arrived and these top predators were seen as pests, resulting in policies that were initiated to lower the wolf population. Wolves were intentionally driven to the brink of extinction by humans, however the remaining wolves were concentrated in the Great Lakes regions and in the 70’s a slow comeback was made as an immigration of wolves from Canada occurred . Government sponsored eradication of the grey wolf began in the 1800s in the USA, and by 1914 the state sponsored the hunting and trapping of wolves and other animals that posed a threat to ranchers and livestock . By 1926, the last pair of wild wolves in Yellowstone were killed. Government bounty hunters reduced the population to a few hundred by the 1930s . Evidence continued to report that wolves served an important role in the population control of deer, elk and moose in the decades that followed . An issue with the reintroduction process was the negative perception of wolves by local citizens, which made it challenging to gain support. There was a general fear of wolf attacks on humans, as well as the constant invasion of wolves on local farmlands that partially spawned from the negative perceptions of wolves . Hunters were also strongly opposed to the idea of wolf reintroduction, as elk in the Yellowstone area were seen as ‘iconic,’ and more wolves meant less ungulates . As conservationists attempted to communicate the issue of wolf absence in YNP to the general public, it became a complex issue due to the lack of understanding as wolves had such a negative reputation. The lack of education on the importance of a predator in an ecosystem was the main reason behind farmers and hunter’s beliefs of wolves being an inconvenience, and studies have shown that education on various topics being transparency and proper information to reduce negative perceptions . Aside from local farmers, as YNP became increasingly popular as a tourist attraction, human safety became a concern for the many individuals adventuring into the park. Although there has been extreme controversy and misunderstanding regarding wolf importance in this ecosystem, this conservation project could represent effective strategies for restoring various ecosystems around the world, and could serve as an iconic example of the importance of an apex predator in the trophic cascade to maintain a productive and natural environment. With the trophic-cascade effects observed in Yellowstone National Park following the reintroduction of grey wolves, the world was able to witness an ecosystem becoming whole again after decades in the absence of a keystone species. With the decision to release wolves back into YNP, came the regrowth of plant species, the return of various aquatic and terrestrial organisms, as well as a shift in the natural landscape. The absence of a highly interactive apex predator, in this case the grey wolf, has been shown to lead to very simplified and/or degraded ecosystems . In addition, when riparian communities are subject to intense browsing, the ecological consequences can become severe, as these plant species are important in a wide range of ecosystem functions both in aquatic and terrestrial environments, as well as geomorphic processes . The reintroduction of wolves had, and continues to have, a propagating effect on multiple trophic levels in this particular ecosystem, from large mammals to soil fertility, and is ultimately what commenced the restoration of YNP’s ecosystem. Following the release of grey wolves back into Yellowstone National Park, the first species to be directly affected was the elk population. 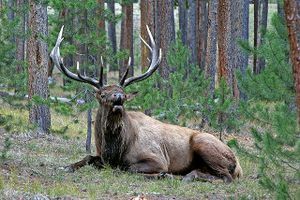 During the absence of wolves, there was an immense predatory pressure taken off elk, which resulted in an overabundant amount of elk in the park. With no need to keep an eye out for predators, the elk didn’t have much need for movement and took over large areas of the park, as there was no need to remain in smaller groups as a method of predatory-defence . Through the 70-year period without wolves, the main causes of death for elk were harsh winter conditions and starvation due to snow depth, however this wasn’t a sufficient way in keeping populations numbers under control, and the elk population in YNP grew tremendously . With an over abundance of roaming elk, the park’s carrying capacity was pushed to its limits as overgrazing lead to a significant decline in riparian plant communities including willows, aspen, cottonwood, and berry-producing shrubs . It was only with the return of the grey wolf that biologists and scientists observed the impact of elk’s grazing habits on riparian plant communities through their behavioral adjustment of less foraging, which lead to an increase in plant populations . In the years immediately prior to the release of wolves into YNP, total elk numbers averaged to over 15 000, however these numbers dropped 18% following wolf-reintroduction, where total elk numbers were approximately 12 000 . With this drop in population through direct predation and altered elk browsing habits, these two circumstances were most beneficial for the park’s ecosystem and biodiversity . When under conditions of high predatory risk, elk noticeably reduced their foraging habits as they became more vigilant, travelled in smaller groups, and were constantly on the move . As the elk population diminished and their grazing patterns significantly adjusted, previously suppressed plant communities were able to flourish again. During the several decades without wolves, plant communities were kept to a minimum due to the overgrazing of elk . Vegetation in this ecosystem is a vital component in maintaining channel morphology and the stabilization of stream banks, in providing habitat for a variety of organisms, and to provide shade cover over streams, which is crucial in maintaining a productive and sustainable aquatic environment. In the absence of wolves, elk herbivory continuously increased, in which plant species structure, succession, productivity, and diversity suffered, which in turn negatively impacted the habitats of other fauna . This decline of woody plant species began in the 1920’s; around the same time grey wolves were extirpated from the park, where various studies on willows, aspen, and cottonwood showed the inability of these plants to grow past 1m in height, which is coincidently the level of elk grazing . Studies found that the extirpation of wolves in YNP is what allowed elk to overgraze plants and seedlings, which prevented any recruitment of these plant species for decades . The new foraging behavior by elk in the presence of wolves, resulted in elk avoiding riparian areas due to high predation risk, and subsequent studies found that cottonwood plants grew tallest in areas where predation risk was high, as well as concluding that this ‘fear factor’ demonstrated by elk’s behavioral change played a significant role in the release of willow and cottonwood . With wolves reintroduced and less browsing pressure by elk, cottonwood and willow plants sought an upward trend in growth, and were noted to be 2 – 4m in height in 2001, which was a great change from the 1m observed prior to wolf release . In a study on plant growth post-wolf reintroduction, results found increases in plant height, stem diameter, stem establishment, canopy cover, and recruitment in areas that experienced a heavy decrease in elk browsing. With the abundance in plant growth following wolf reintroduction, studies concluded that wolf extirpation in YNP was the most likely cause in the decline of woody plant species, and the decision to reintroduce grey wolves into the park was a necessary component in restoring riparian ecosystems, and thus, increasing biodiversity . With the resurgence of plant communities, the food web and habitat availability has increased to support numerous terrestrial and aquatic organisms, for example, songbirds have returned to YNP due to the restoration of shrubs and trees, providing habitat for 6 different songbird species, as well as bears benefitting from the regrowth of berry-producing shrubs . With an increase in woody plant species, beavers made their way back into YNP as they feed on willows, and the combination of these two events influenced a growth in riparian ecosystem diversity, as well as stream hydrology . As riparian plants began to grow in abundance after many decades of being suppressed, more beaver colonies were making their return into YNP . In the 1920s, beavers underwent a major decline, specifically from 25 colonies recorded in 1921, to about 6 colonies by the 1950’s . During this time, there was no evidence of willows or aspen being used for food or for building purposes by beavers, which reflects the period in which plant communities began to suffer from overgrazing . Through studies conducted in 2001, 49 beaver colonies were located in YNP, and increased again to 85 colonies in 2003 . With a growing beaver population following the regrowth of aspen and willows, new beaver dams were created which affected stream hydrology . With dams coming into effect and the newly abundant riparian vegetation, plant roots were able to stabilize streams, and dams slowed the flow of water, as well as evening out seasonal pulses of runoff and increasing the water table . Willows benefitted from the higher water table, and riparian plant communities became even more abundant around stream channels . Beaver activity, in conjunction with an increase in vegetation, decreased stream bank erosion, increased sediment retention, and allowed for widened, shallow streams to become narrower and deeper . As shallow streams became deeper, and plants grew to provide shade, this cooled down stream temperatures which aided in the regeneration of trout and other fish species . Prior to beaver colonization in YNP, stream bank erosion had caused waterways to shift in location and become increasingly braided, a sign of low stability and a lack of vegetation, as well as having profound ecological consequences as the abundance of amphibians, butterflies, and fish were drastically reduced . Through the trophic cascade following the reintroduction of wolves, the creation of beaver dams along with the new growth in vegetation was able to alter the natural landscape of YNP, to create a more productive and sustainable environment for both terrestrial and aquatic organisms, which ultimately assisted in the restoration of YNP following wolf reintroduction. The direct effects of wolves on elk were illustrated above, as well as the indirect effects on vegetation, beaver colonies, and hydrology. These topics are some of the most commonly studied adjustements following wolf-reintroduction, however there are various other organisms that benefitted from this trophic cascade that occurred in YNP. With wolves hunting more elk, scavengers such as bald eagles, ravens, and magpies were attracted back into the park as wolf-killed elk carcasses were left behind . Coyote populations declined with the reintroduction, however this allowed mice and other rodent populations to increase, further attracting avian predators as well as red foxes and badgers . This wolf-triggered ecological cascade likely increased net nitrogen mineralization in grasslands due to the large decline in elk browsing, allowing the soil to become healthier and more productive . Overall, the public was exposed to scientific evidence as to why the reintroduction was necessary which allowed them to better understand ecosystem and its organisms interactions.The evidence covering the degradation of landscapes, the loss of biodiversity were all key components that helped communities of Yellowstone understand the complexity of the absence of the wolf species. Wolves were seen as vicious killers who caused damage to farmland property and livestock, and who ultimately served no benefit to humans . Most nonindigenous peoples wanted wolves eradicated from the park, as they didn’t believe wolves had any benefit to humans, to other wildlife, or the landscape . Through the eyes of conservationists, wolves provided ecological benefits to the ecosystem that would benefit other organisms, which would have cascading effects through various trophic levels . After wolves were reintroduced to the park, economical benefits ensued as more tourists and nature-seeking individuals were attracted to the park, which benefitted local and state economies . A study conducted on the economical benefits of wolf recovery in YNP showed a $23 million increase in revenue due to heightened tourist presence in the park, however the follow-up results study demonstrated that wolf presence in YNP brought in 35 million annually to local economies based off tourism and wildlife-viewing alone . As previously mentioned, through the cascading effects of wolves, increasing numbers of trout and other fish populations were appearing in the park, which reintroduced recreational activities such as sport fishing, this also added to the increase in local incomes . Wolves famously restored the natural ecosystem of YNP, but also provided an immense benefit in local economies. In earlier years, species have been removed from the list of endangered species once they’ve made a broad-scale recovery throughout their historical range. In 2011, Congress removed Endangered Species Act (ESA) protection for grey wolves in Idaho and Montana. Legal processing and debating of grey wolf removal from the endangered species list has yet to be finalized and reviewed, as politics ignored biologists' warnings, which lead to a lack of fair legal justification causing the species to be delisted . Thereafter, recovered wolf populations in YNP lead to intriguing political discussions about the importance and management of the species within this landscape. Given the fact that often media seems to paint these wild animals as vicious for taking the lives of both people and livestock, it all became evident and factual when outcomes of the reintroduction were further analyzed. Wolf recovery sparked arguments, where the public became involved in the discussion on wolf management practices and democratic processes, as well as debates on ethical principles with the reintroduction and how to move forward . To reintroduce wolves in Yellowstone, organizers faced many challenges during its initial stages and dealt with one of the most controversial wildlife projects of the century. Several lawsuits had attempted to halt the return of wolves to Yellowstone, as the Idaho governor threatened to call out the National Guard to stop a shipment of wolves at his state’s border . In 1994, the American Farm Bureau Federation sued the reintroduction program and fought for the removal of the wolves from Yellowstone . The opposition claimed the program violated the Endangered Species Act as it was unlawful for ranchers to shoot wolves if necessary, even as the reintroduced wolves were an 'experimental population' who weren't protected . In 1997, the court ordered for wolves to remain in the park. The extensive history of wolves attacking and destroying livestock has created negative relationships between ranchers and wolves . A main reason why wolves were first extirpated from YNP was due to the intense local opposition of ranchers who were continuously losing livestock, and thus income, from wolves scowling the area. Although various boundaries were set in place to prevent this wolf-caused destruction from occurring, the wolves were ultimately not stopped from harassing livestock, as many adult males leave park boundaries in search for accessible food . After wolves were reintroduced into the park, their population experienced high success rates, causing nearby ranchers to worry once again about the fate of their livestock . With excessive debates between farmers and conservationists, organizations such as Defenders of Wildlife implemented various compensation programs to simultaneously protect the wolves and satisfy the farming community . The Bailey Wildlife Foundation Compensation Trust was put into place to compensate any farmers experiencing losses of livestock and herding dogs that have been taken by wolves and other predatory species . In addition, a nonprofit organization, the Predator Conservation Alliance, has implanted strategies to help protect livestock from wolves, and to commercially market products from farms and ranches that use wolf-friendly methods in protecting their livestock . Hunters have also sparked debate, as the wolf release has caused a significant decline in deer and elk populations within YNP, which would affect their hunting practices . Although hunters have raised their concern, various other strategies have been implemented to satisfy both conservationists and hunters. The Montana Fish, Wildlife & Parks Commission created the Wolf Management Unit 313, which reduced the quota and season length on the harvesting of wolves that migrate outside park boundaries, and similar propositions have been made to reduce the hunting quota in other areas of the park as well . This plan is believed to allow visitors and nature-seeking individuals to continue viewing the wolves to maintain tourism, but to also satisfy hunters and trappers without significantly altering the wolf population . The issues surrounding the reintroduction of wolves to Yellowstone go far beyond simple policy solutions . The many differing opinions in the Yellowstone question have been fueled by many different interest groups which include economic, political and personal emotional investment in the reintroduction of Yellowstone’s wolves . The stakeholder approach to areas such as Yellowstone have limitations, with arguments surfacing over the benefit of outcomes in collaborate sessions as being over compromised to suit all needs and that don’t necessarily solve the problem  However, Yellowstone has adopted a form of a stakeholder approach called the ‘Adaptive Management Approach,' which claims to allow the acknowledgment of ‘uncertainties in the management of natural systems and respond to changing resource conditions’ . The contentious delisting and relisting of Yellowstone’s grey wolves from the endangered species list indicates the issues with management practices that are too flexible and lead to great uncertainty over decision making. Excessive compromise can lead to inefficient or unsuitable actions, an issue often highlighted with stakeholder groups and co-management agreements . In Yellowstone, a great deal of conflict seen between the various stakeholders was due to a lack of understanding from each group involved in wolf management . These issues stem from the differing views on wolves, as local Indigenous peoples and conservationists viewed wolves as part of nature, and farmers and hunters saw wolves as being vicious pests . The approach taken in Yellowstone is one that has been implemented across the National Parks system in North America and beyond . It is evident that a willingness to cooperate and acknowledge the other parties is required from all sides to foster an understanding of differences  . In Wyoming, a program was implemented that included locals in the tracking and monitoring of wolves in Yellowstone, providing researchers with cost-effective measures to obtain additional information, and to allow members of the public to become more involved with wolf management and protection, as well as to understand their significance in the landscape . By having various stakeholders actively involved in management programs, this appears to be a more effective way to encourage co-management engagement from all sides, and to help stakeholders recognize the demands of others. Looking at the history of wolves within Yellowstone National Park, USA., it is evident that their protection is of great importance to the ecosystem, as well as the reintroduction becoming a major social and political concern. The return of wolves to Yellowstone will hopefully allow for other nature parks and wildlife reserves to learn the importance of trophic cascades in any ecosystem, and how the removal of one species from an ecosystem can have dire effects. As seen throughout this wiki page, the reintroduction of wolves had an immense effect on the ecosystem, however the support by many other species such as plants and beavers, were also key contributors to this restoration. Although there was extensive controversy surrounding this decision, the programs and strategies implemented to satisfy the needs of all stakeholders is a prime example of the necessary steps needed in successful co-managment plans. Hopefully the grey wolf reintroduction into Yellowstone National Park is a precursor for future conservation strategies around the globe, and can serve as an illustration of the significance of ecosystem interactions. ↑ 14.0014.0114.0214.0314.0414.0514.0614.0714.0814.0914.10 Defenders. (2017). Publications. Social and Ecological Benefits of Restored Wolf Populations. Retrieved from https://defenders.org/sites/default/files/publications/social_and_ecological_benefits_of_restored_wolf_populations.pdf.